1 What is common cold? Common cold is a respiratory illness caused by viruses. It is one of the most common illnesses which causes more casualties. Much more work absence either at workplaces or schools is also due to cold. It particularly affects young children who usually experience from three to eight episodes a year. Cold virus is spread by contact or by inhalation. Incubation lasts two or three days. if no complications occur, it will affect the sick person during a week, more or less. It usually appears in winter. It manifests initially as a sore throat or sore nose. Later, the typical runny nose and frequent sneezing appear. It often triggers asthma and ear disease in children. The more usual symptoms are: coughing, aphonia, runny or stuffy nose, sneezing, low fever, etc. More rarely other symptoms appear like headache, sore throat or cough. Cold has less acute symptoms than flue. Common cold can occur throughout the year, while flu tends to occur during the winter. Flu is different from cold primarily because the affected individual has higher fever, something that, all of a sudden, may go up easily to 39, 5 º C or it can even reach 41 º C.
Moreover, flu distinguishes from cold because flu produces a feeling of heaviness and pain throughout the body, particularly in the joints. 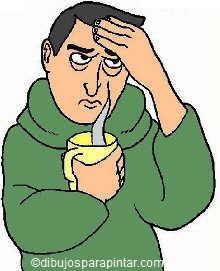 Headache is usually stronger in flu than in the cold. Patients with flu typically have dry cough. Whereas a person may have multiple colds each year, flu, if any, appears only once every year. We must distinguish this disease from that one called “stomach flu” that occurs when bacteria infect the digestive tract. Should common cold be treated with antibiotics or other medicines? Cold usually disappears by itself and treatment is only directed to make the symptoms more bearable. It should not be treated with antibiotics as these are ineffective against viruses that produce it. – It lasts more than one week or one week and a half. In adults, it is common to use decongestants (for a better nose breathing) and antihistamines (To reduce mucus and sneezing). These can cause drowsiness and be dangerous when performing delicate activities or driving. They are not recommended for children under 5 years. Analgesics are usually given for pain. Remember that aspirin should not be given to children or teenagers under 21 years, because its use is associated with Reye’s syndrome, a serious neurological disease that affects the brain and liver. The natural treatment of cold involves using a series of natural resources which will increase the immune function and will help relieve the symptoms of this disease.